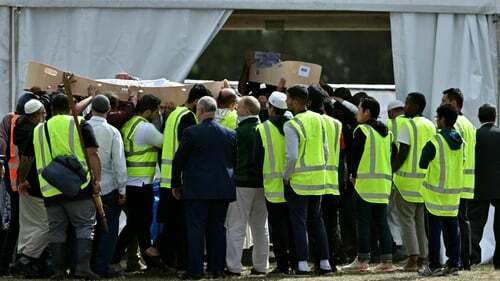 A Syrian refugee and his son were buried in New Zealand in the first funerals for those killed in the twin mosque shootings as Kiwis braced for days of emotional farewells. An Australian white supremacist gunman killed 50 Muslim worshippers at two mosques in the southern city of Christchurch last Friday. Hundreds of mostly Muslim mourners gathered at a cemetery not far from Linwood Mosque, the second of the two places of worship targeted. There they prayed and laid to rest Khaled Mustafa and his 15-year-old son Hamza, their names broadcast over a loudspeaker. The Mustafa family arrived last year as refugees in New Zealand seeking sanctuary from the civil war in Syria. Younger brother Zaid, 13, was wounded but survived and attended the funeral in a wheelchair, his hands held aloft as he prayed alongside the rows of mourners. Also among those in attendance was Abdul Aziz, an Afghan refugee who bravely confronted the gunman at Linwood Mosque. He was hugged by many mourners. Muslims whose loved ones were killed have had their grief compounded by the delay in the return of bodies to families in time for a speedy burial, as required under Islamic custom. In a briefing, he said he hoped a further six bodies would be returned to families. Prime Minister Jacinda Ardern visited Cashmere High School, which lost two students in the shootings - Sayyad Milne, 14 as well as Hamza Mustafa. Asked by a student how she felt, Ms Ardern replied simply: "I am sad". A day earlier Ms Ardern vowed gunman would face the "full force of the law" as she opened a sombre session of parliament with an evocative "as-salaam alaikum" message of peace to Muslims. The so-called Islamic State group, in a message on social media, appeared to encourage retaliatory attacks. Following the mass shooting, Ms Ardern has promised to reform New Zealand laws that allowed the gunman to legally purchase weapons used in the attack.